NEW! Click here to read our Breaking News supplement! NEW! Tucked into the crowded grounds of the famous model village (1:12 scale, 1.5 acres) at Bekonscot, in Buckinghamshire, England, is a ride-on railroad that is nearly a perfect prototype for a model micro layout — the Bekonscot Light Railway. Opened quite recently in 2001 (the village has been there since 1929), this little line is the brainchild of Merve Hill and Tim Dunn. Tim writes, “We run a short, 7¼in estate line with 20ft radius curves and a total trip length of 300 yards. The terminus is tiny, and to run trains successfully we’ve had to build a point (turnout) atop the turntable and a full-sized sliding cassette traverser to store our locomotives [see below]. Doesn’t that sound a lot like what we go through to design a micro layout to provide great operation in a very tiny space? The ultra-compact track plan for the BLR is shown here. Notice that a train on the “main line” circles the garden two and a half times before it heads back for the terminal. Tim modestly comments, “The trackplan for the ‘circular’ part of the route is (I think) pretty darned brilliant for the space available, which is 45x85ft. It’s all sprung points (spring switches) and from 2008 we’ll be able to run two trains on it despite the repeated track circuit and small space, as you can see from the directional arrows on the track plan diagram. “Our stock is varied. 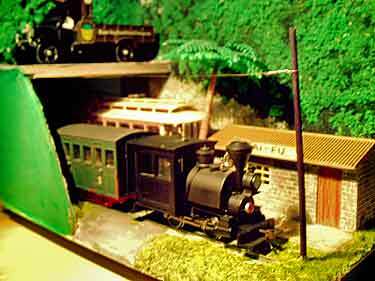 We started out with a 1/3 scale Hudson Hunslet and a single coach. 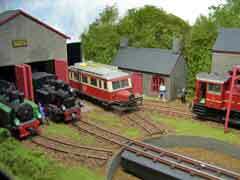 We’ve now got a custom-built dual-ended tram, a ride-on spare loco and a freelance ride-in shunter (right photo above). 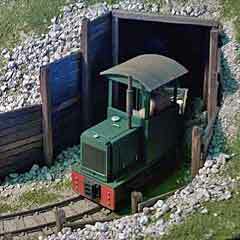 They’re not miniatures: they’re extreme narrow gauge and fit for purpose. But perhaps the most unusual space-saving on the little line is at the Terminus. 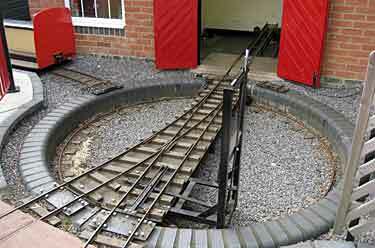 In order to be able to reverse the locos in the very short space available, the builders were forced to place the runaround loop switch on the turntable (photo at right). And as you can see, there’s very little room for the loco shed in either width or depth, a space crunch that has created the need for one of the most innovative installations on the railway — the “collapsible traverser (transfer table).” You can just see it inside the loco shed door, and its unusual workings are diagrammed below. 4 1. Normal position of empty table.2. Pushed left to align track R3. 3. Loco from turntable enters R3. 4. Pushed right to load track R1. 5. Centered again to load track R2. Now there’s a full house in an incredibly shallow and narrow space! The modeling possibilities of this little line boggle the mind. 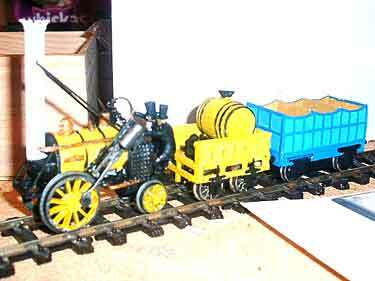 The easiest gauge to use is 16.5mm, which is very close to 1:12 scale for this 7¼in gauge line. 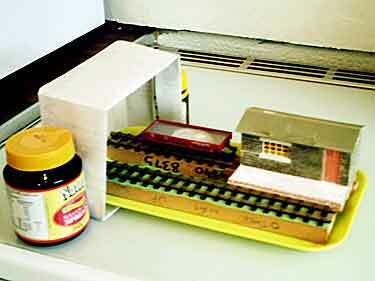 This is a standard dollhouse scale, and many architectural details and even some usable human figures are readily available. The Bekonscot Model Village, which surrounds the railway, is built at 1:12 scale also, which means a model version could be made of 1:144 scale structures, which is very close to the 1:148 scale of available British N structures. 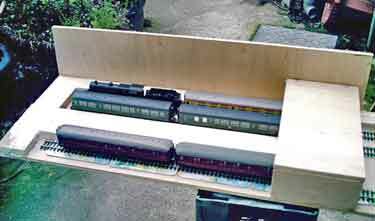 Another possibility might be to use 9mm gauge, which would work out to 1:20 scale — 15mm to the foot, very close to SM32 in Britain and F scale in the U.S.
Bob Hughes, from Sandbach, Cheshire UK, has completed the latest in his series of fully operating tea-tray layouts. This one, Tai-Fu, is O-16.5 (On30) and depicts “a small wayside station where a narrow gauge railway reverses at one end of a zigzag [switchback] as it climbs a steep mountainside as in the Andes and the Far East.” The simple track plan of the 11¾x6½in (30×16.5cm) layout is apparent in the construction photo (above left). 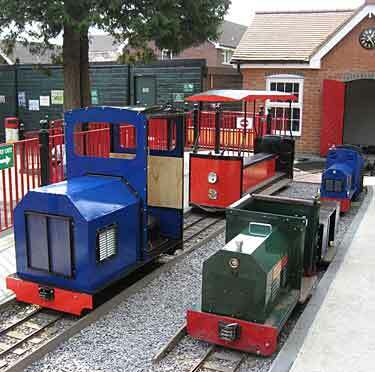 The end result (above right) shows a Porter 0-4-0ST with four-wheel coach about to reverse and continue its journey. 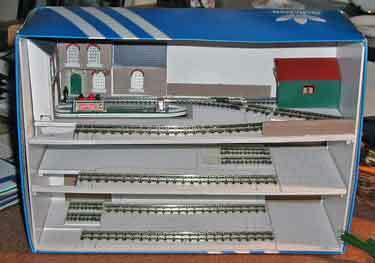 The layout is designed to be used with the same cassette fiddleyard (right photo) as Earles Quay (shown at left in photo below), an OO/HO layout also using 16.5mm gauge, which was described in Scrapbook #57. Each of the two tracks on both layouts is “live” only when the fiddleyard cassette is attached to it. 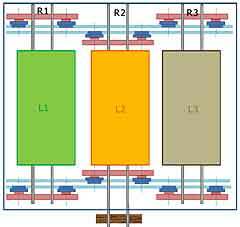 The current is fed via two springs, made from paper-clips soldered to the rail ends, that also ensure the rail ends line up. 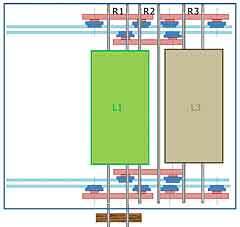 Bob exhibits the two layouts together, as a matched pair, in order to demonstrate that scale and layout size are not directly related. 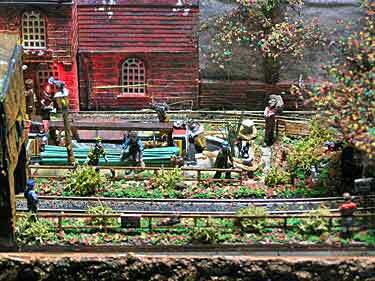 I think his “plug in” fiddle yard is also an idea worth noting! For more, see Bob’s website. Joern Pachl is a Professor of Railroad Systems Engineering at Braunschweig Technical University in Braunschweig, Germany. Joern runs an undergrad and graduate program about railraod infrastructure, operation, and signalling. 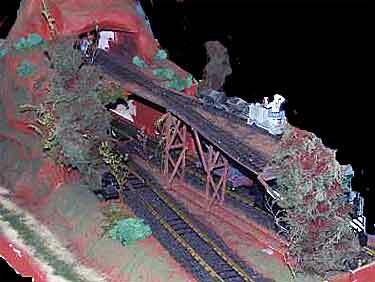 Naturally, as a professor of railroading, he must make his home layout accurate and prototypical! 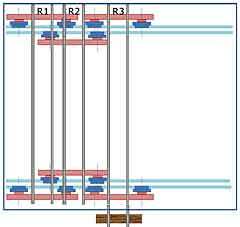 The track plan is shown above. 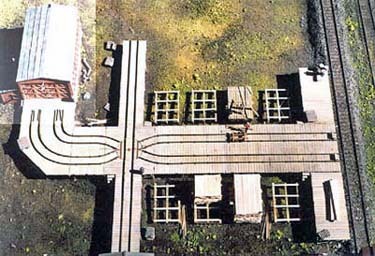 It’s a TT scale modular layout that shows the standard gauge part of the prototype station Drei Annen Hohne at the former Halberstadt & Blankenburg Railway (HBE). The time is the late 1940s shortly before the take over of the Deutsche Reichsbahn. The two photos above show each end of the 3570x420mm (141x16in) railway. At the left end of the station (above left) we can just see the ends of the narrow gauge Harzquerbahn (not modeled further) sharing the freight yard with the standard (normal) gauge. At the right end (above right) is an industrial spur for lime processing and loading. The station itself is shown (below) as a passenger train headed by the locomotive “Elch” gets ready to pull out from the station. For more information consult Joern’s website. This kind of “long, thin” railroad is superb for enhancing a feeling of the reality of trains actually going places. See Scrapbooks #46 and #49a for more examples. 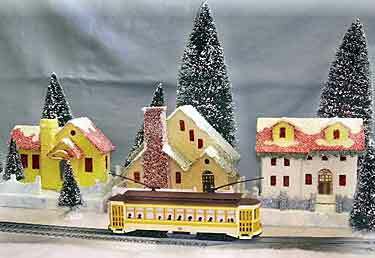 Howard Leroy Lamey, from Jacksonville, Florida USA, has started creating his holiday layout, the Pine Mountain Valley RR, using materials from his “other hobby” — creating classic Christmas houses from cardboard and crafts materials. Howard builds them in the style of the Thirties, before the arrival of plastics, and he captures the distinctive look of those nostalgic structures. Although this idea was new to me, there appears to be quite a following for this unusual hobby! Howard has promised to send us a photo of the PMV’s 2007 edition as soon as it’s ready, but in the meantime has sent a couple photos that show how well his decorative re-creations blend with period trains (HO scale). 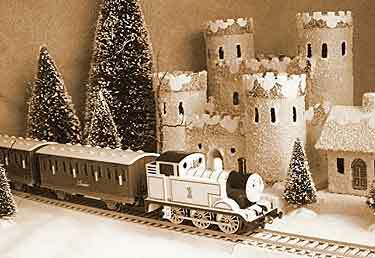 The Bachmann trolley glides past a row of 1930’s houses (left), and Thomas the Tank Engine, with two carriages in tow, is passing a classic castle. They’re a great reminder that there are lots of ways to approach this hobby of model railroading … and here’s an interesting and different one! If imitation is the sincerest form of flattery, then Sven Loeffler, from Frankfurt am Main, Germany, is a champion flatterer! 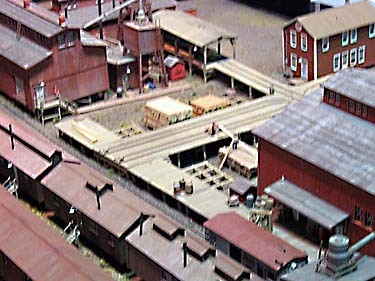 His shoebox railway, Stratford Yard, essentially duplicates the plan and scenery of Michael Campbell’s prize-winning shoebox layout, Southon Yard. It’s H0e scale (H09/HOn30) and measures 33x23cm (13x9in), with a 13cm (5in) fiddle yard.But Sven decided to add something extra — animation. 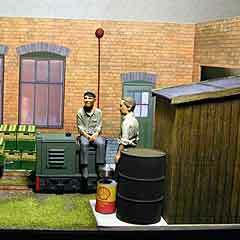 And he has posted video clips on the Internet to show the various animated scenes on this little layout. You can view them by clicking on their names: a railway worker, the turntable operator, another railway worker, a postman and dog, and the dispatcher. 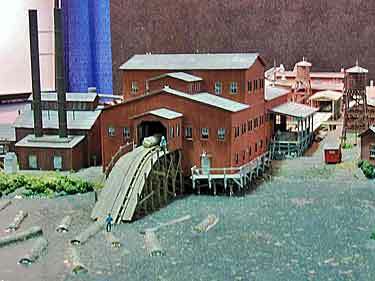 In addition the coal crane is a working model … lots of action in a very small space! Sven also has a larger H0e layout shown on his website. When Rob Merritt, from Georgia, USA, decided to buid his first G-scale layout, he opted to copy a proven design – my Carl’s Exports, 12x48in (30x120cm). Then he decided to add a Gn15 mining railroad on the upper deck. Below, he uses an Aristo-Craft Lil Critter lokey and some Hartland four-wheel cars. The result is a layout that’s distinctively his own! IDEA: TURN A SHOEBOX ON ITS SIDE… AND FILL IT UP! 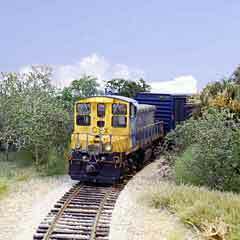 Faced with the challenge of ExpoNG 2005 to build a working layout in a shoebox, Andrew Glover, from Retford, Nottinghamshire England, decided to build his first layout in 20 years. And although the size was miniscule, he opted to put in as much activity and detail as he could. 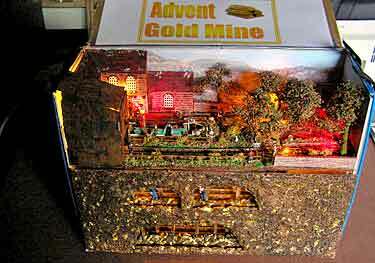 The result was Advent Gold Mine which, believe it or not, is still a work in progress! Andrew began by putting the shoebox on its side and building a sturdy three-level plastic box within it. The plastic was laminated in several layers, allowing cutout space for the several traversers (transfer tables), a lift (elevator), a sector plate (on the top level) and a canal basin. Track (upper left photo) is 9mm gauge using OO9 (HOn30) scale. 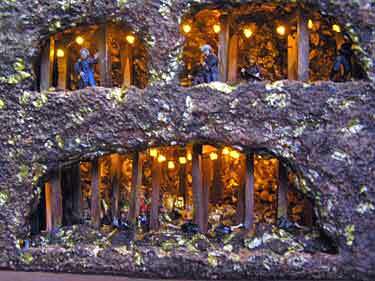 The lower two levels became underground mine passages where ore cars are filled with gold ore (gilded kitty litter!). Locomotives on both levels push the wagons into the lift, which raises them to the top level. There they are pulled to the canal basin (via the sector plate), where a “diagonal wire” tips the bucket so the ore runs out into the canal boat cargo hold. From there, it descends through hidden tubes back to the lower mine level, filling an ore car waiting to repeat the process. The layout is inhabited by a horde of miniature people (some are animated) plus as much scenery as a shoebox can reasonably be expected to hold. But there’s more. Andrew has been challenged to convert the canal basin to a lock that can be filled and emptied with real water. Plans are in hand, and work is scheduled to begin shortly. 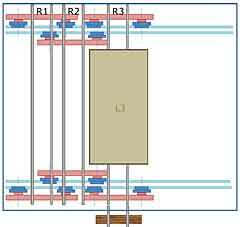 Compressing passenger train operations into a micro space is one of the ultimate challenges of small layout design. Bob Hughes, from Sandbach, Cheshire UK, is building a clever approach. “I’m trying to create a main line terminus in the early 60s,” he explains, “with the arrival and departure of (implied) full length express trains, hauled by large locomotives, yet confined to 4 square feet.” Impossible, you say? Check out the photos! Bob calls it Sutton Road. To start the sequence: Platform 1 – empty. Platform 2 &ndash DMU (push-pull multi-unit railcar). Platform 3 &ndash 2 coaches (tail end of train ready to depart). 1. DMU departs Platform 2. 2. Train arrives Platform 1 (Steam loco+coach). 3. Station pilot (unseen) propels 2-coach train into Platform 2. We now have loco-hauled trains in all platforms: arrival in 1, departures in 2 and 3 (as shown in upper left photo). 4. Train departs Platform 3. 5. Station pilot (again off stage) removes coach from Platform 1. 6. DMU arrives Platform 3. 7. Loco in Platform 1 departs, running light. This leaves platform 1 empty again, with a 2-car DMU on 3 and the coaching stock waiting to depart from 2. 8. Another DMU arrives on Platform 1. 9. Coaching stock departs Platform 2. 10. DMU departs Platform 3. Station now empty apart from the DMU on P1. 11. Main line diesel arrives Platform 2 with coach (implying an express train). 12. Station pilot shoves Baggage Car into Platform 3 , departs running light. 14. Station pilot (unseen) removes the coach from Platform 2. 15. DMU arrives on Platform 3, stopping short of the Baggage Car which is still there. 16. Station pilot (unseen) propels 2 coaches into Platform 1. 17. 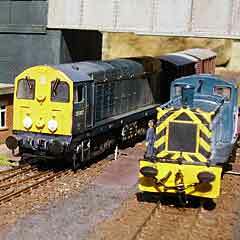 Diesel from move 11 departs light from Platform 2. State of play now: Baggage and DMU in Platform 3, Platform 2 empty, Platform 1 train awaiting departure. 18. DMU departs Platform 3. 19. Railcar arrives Platform 2. 20. Station pilot arrives Platform 3, departs with Baggage Car. …And so it goes on at this busy passenger terminal! The illusion of busy passenger service is amazing, and using imagination a widely varied and interesting timetable can be developed! 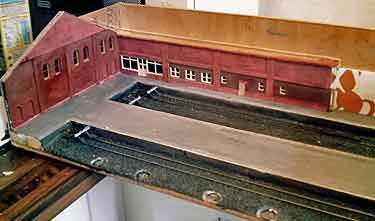 A variation for American modelers, for example, could treat the scene as a Union Station used by three or four railroads. For those interested, Bob has chronicled the building of Sutton Road online. 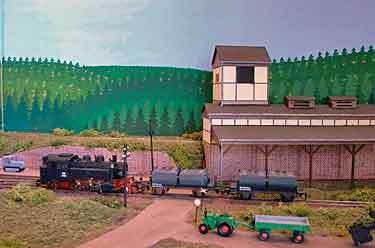 Typically, very small layouts will need to hide some of their running lines or their fiddle yards, in order to be able to replicate real railroad traffic on-stage. A classic dilemma in layout design is “How to exit the stage into the hidden realm gracefully, without looking like an obvious fraud?” Here are a collection of photos showing most of the conventional ways of departing. If you have a different way – especially a creative or clever one – I’d like to hear from you. We’ll publish the best ones in a Scrapbook page soon. Here are some classic exit lines (starting above). 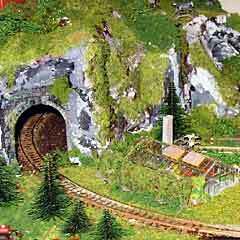 Disappearing into a tunnel (left) is used the world around, as in this example from Franzbourg, an N scale layout by Francesco Zezza, from Rome, Italy (watch for full story next month). 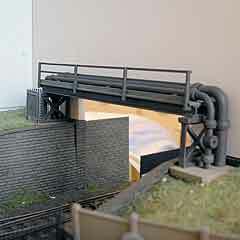 Ducking under a bridge and out of sight (center) is also a popular dodge, as in Neptune Street Yard, a British OO layout by Anthony Bilton (to be featured here soon). Steve Bennett’s delightful little Gnine display layout (right) uses a view-blocking structure and scenic doodads to hide the exit. 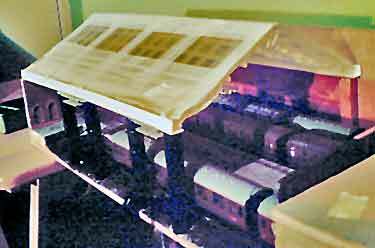 Large pipes carried over the tracks on scaffolding conceal the escape hatch in this box file layout (left) under construction by Colin Peake (and set for an early appearance in these pages). 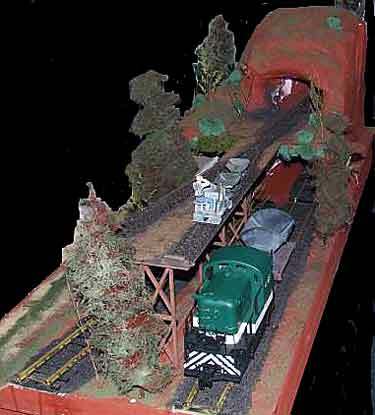 A variation on the tunnel theme — disguising the entrance as a mine adit — is typified by Black Cat Mining, a much-traveled Gn15 line built by Sidelines Models boss Steve Bennett. And below are three variations on the familiar theme of exiting “into the woods” — ducking off into the shrubbery or the trees. At the left a switching turn heads out of sight on the wonderful Miami East Industrial layout of Lance Mindheim. 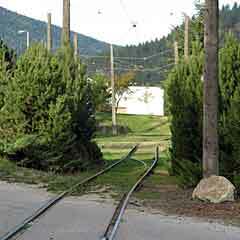 In the center is a prototype example, snapped on the Nelson Electric Tramway by Brian Wilson. 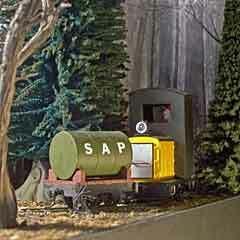 And on the right is the maple-syrup train on the SAP Line by Carl Arendt, about to disappear into the woods. If you have another example of a graceful exit, please send it in! Just click on “contributions” at the bottom of the page. 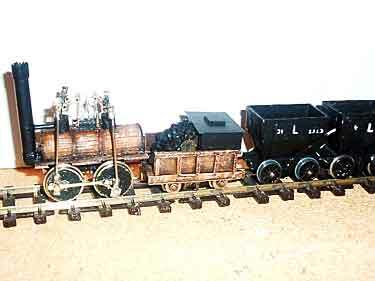 A seldom-modeled chapter of railway history is the earliest one, from about 1825 to 1845 or so. It was a fascinating era, full of engineering marvels and inventions. The coaches looked like carriages, and the locomotives looked like grasshoppers. The railways vied with canal transport for dominance, and canalside quays were a scenic feature of many early lines. Modeling them is an absorbing challenge, requiring research and considerable scratchbuilding, although some commercial models are available in both North America and Europe. Here are a few ideas about this exciting but rarely seen part of the hobby. Andy Young, from Stockton, in the northeast of England, is assembling a roster of very early locomotives with the aim of building an 1830 layout (still on the drawing board). Andy’s home town was one terminus of the world’s first permanent steam-driven railroad, the Stockton & Darlington Railway which opened in 1825. Goods (freight) and passengers were dealt with together, usually at a relatively small site. Stations might be built in classical architectural style (very early ones were just temporary wooden buildings). The structures would be too new for much, if any, weathering. An overall roof covered the platform and running line, with the outer side held up by delicate wrought iron pillars. Passenger platforms were short and low, perhaps about 15-18 inches above rail height. A bay road would allow side unloading for horses and end loading for carriages, as the gentry travelled with their carriages for onward transport from their rail destination. Wagon turntables were very common. These could be purely cosmetic in model form. Short four-wheeled rolling stock was the norm. Sharp radius turnouts can be used. Track would be ballasted above sleeper (crosstie) height. Giles has also kindly provided two preliminary layout designs, along with layout notes, as a guide for modeling early railways. Eatonswill is 6ft (1.8m) long plus fiddle yard and has an urban feel with Georgian (and older) shops and houses backing the station yard. There is a three road locomotive shed as well as a carriage shed, although with the three tracks through the station you could also stable passenger stock under the station roof. There is quite a serious coal yard (coal was used for domestic heating and gaslight) and a large general freight shed. The line vanishes under a wrought iron bridge (Wills kit) en route to the fiddle yard. The Legend for both these plans is as follows: (1) Passenger station, (2) Goods shed (Freight house), (3) Locomotive shed, (4) Carriage shed, (5) Loco coal pile, (6) Workshops, (7) Water tank, (8) Domestic coal yard. 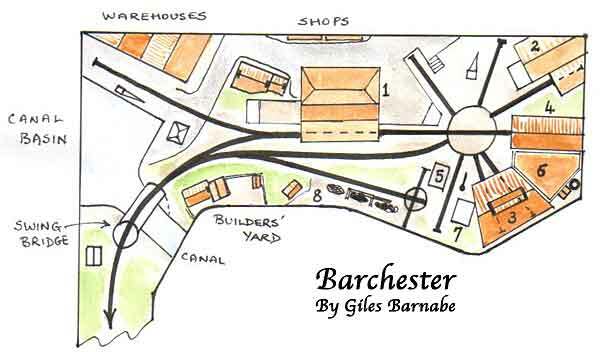 Barchester has been designed for an L-shaped site about 5ft (1.5m) long in either direction. 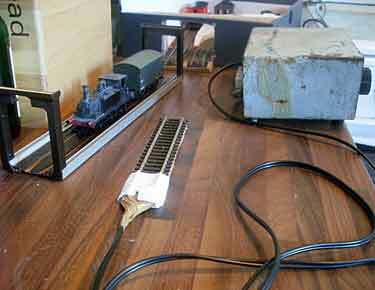 The baseboard is wider and there are more scenic possibilities. A canal basin at one end, complete with swing bridge, will provide some transfer traffic, and a busy station yard is at the other end, where the main turntable completes the runaround loop as well as serving the locomotive depot, carriage shed and three goods roads. Apart from a Peco Streamline small wye point, the other two turnouts are curved and straight right handers from the Setrack range. 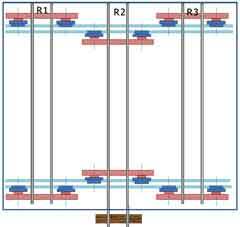 In both plans, note how all sidings off the turntable that need to be shunted have an opposing line where a locomotive can wait to push or pull wagons into the stub sidings. Turntables have been drawn at 6 inches diameter, so as to use the Peco N or HOm scale turntables converted to 16.5mm gauge, as has been documented in the model press.